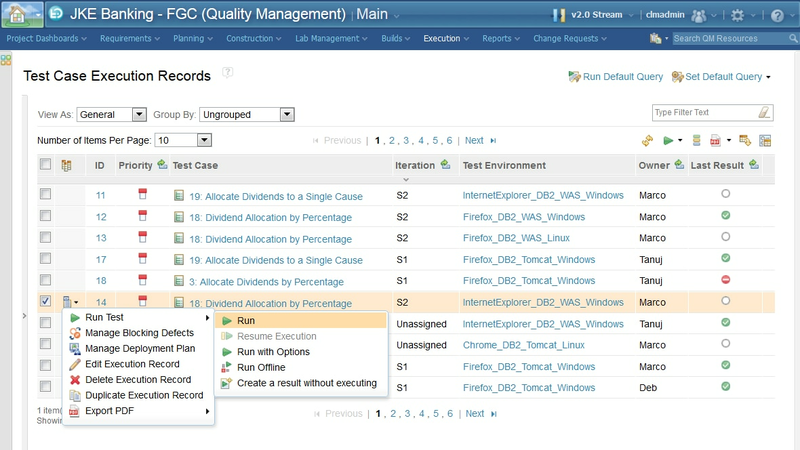 IBM Engineering Test Management is a collaborative, web-based, quality management solution that offers comprehensive test planning and test asset management from requirements to defects. Built on the Jazz platform, it enables teams to seamlessly share information. It uses automation to speed project schedules and report on metrics for informed release decisions. It can also be purchased as part of the Engineering Lifecycle Management solution—a set of seamlessly integrated tools: IBM Engineering Workflow Management, IBM Engineering Test Management and IBM Engineering Requirements Management DOORS Next. Use test plans that are customizable live artifacts which capture a variety of testing activity dimensions. Provides help to meet regulatory requirements and get ready for compliance audits. Always have an accurate real-time status without having to ping each and every team member. Accelerate manual testing using rich text, in-line images and assisted data entry and validation for precise test definition and execution. Use the cloud to get up and running faster and focus on technological innovation. Whether it is a test lab or virtual machines, track all your lab resources in one place. Make sure that the required resources to execute your test plan are available.